Do you struggle with seeing happy photos on social media of happy families with ‘perfect’ lives? How do you keep perspective when chronically ill? Karen shares. “When times are good, be happy; but when times are bad, consider: God has made the one as well as the other. Therefore, a man cannot discover anything about his future” (Ecclesiastes 7:15). When I was young, I had hopes, ambitions, career goals, family plans just like everyone else. I was achieving my career goals. I was proud of what I was accomplishing. 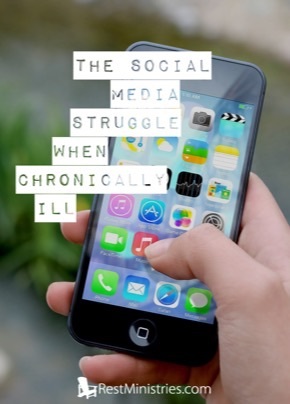 Then chronic illness entered the picture. I was never able to have children. In my mid-30’s, I had to quit working completely. Nothing prepares you for that. I remember after giving my notice to my boss, I went in my office, closed the door, and cried. I couldn’t believe this was happening. After a couple of years, my health improved enough that I could work part-time, but my career was over. I was lucky to find any job that was in my career field with part-time hours. Not to mention, I didn’t know how long my health would allow me to work at all. As I spend time on social media, I see my friend’s lives with their jobs, families, and activities. It makes me feel like my life is so inconsequential. I don’t have all the things my friends seem to have. They have families, little league games, vacations, career honors, active in civic groups, etc. It’s too easy to compare yourself to others and feel inferior. I often see my contribution to this life as insignificant compared to others. After all, I struggle with daily living tasks. Everyone else’s life seems so much more meaningful than mine. But that’s where I am wrong. We are all important to God. No one is more important than the next. That is the wonderful thing about being part of the family of God–we are all included in the family. Never think you are small in this big world. After all, Jesus died for you. He would’ve died for you even if you were the only one. Your life matters. Prayer: Lord, help me not to doubt my significance in this world. Thank You for loving me so much that You died on a cross. Help me to see my place in this world. Amen. Do you struggle thinking everyone else has a better life when you are on social media? Do you ever feel like your life has no bearing in this world? Karen – I so understand. Social media – esp. Facebook – is a real minefield for bringing up comparisons. Yet one thing to remember is that most people ONLY post the happy side of their lives. Who is to say all is so “perfect”. True, I hear the deeper cries of your heart, as well – for the loss of dreams so much alive that will never be a reality. But then “we” who live lives differently can be such inspirations as we reach out and support those who live with daily challenges. In fact, I am involved in groups on FB who do just that and it turns social media into a place that is “more than” for those who feel “less than”!! I appreciate your addressing this all too real phenomena. Karen, thank you for sharing your struggles in this area. I also have times of comparing myself to what others are able to do. I fight jealousy too. Like you, I have had to give up my profession even after spending two years going through a re-entry program and not feeling well enough to work when I finally finished. Of course this affects our income a great deal. I ask God to help me focus on what I am physically able to do and to be grateful for the good days. He is using us to encourage others as they see how we continue to love Jesus through our chronic illness. You have encouraged me today! Thank you for this. I needed this tonight. I am soon to be 30, my career ended 5 years ago, merely one year after I married my best friend. Due to physical disability and struggling with a disorder that has caused I infertility the last 6 years, I constantly struggle on fb seeing all of my friends having their families and careers and amazing vacations when getting out of bed some days is a miracle. Then I get angry that I am jealous of these people and try to remind myself of what I am thankful for. My husband and I have had 9 years of our lives to just be us, we grew together and know each other better than ever. Because we weren’t juggling 2 careersand a family we were able to build a stable lasting relationship that can now withstand things like a family and career. Such a good reminder. That first part about having to leave your job was my situation exactly (even the same time frame), but I have never had the opportunity to work again. Just recently I was in a time of grieving the loss of my dreams for my career when God pointed out to me that He has brought my dreams to fruition, but in a totally different way than what I had expected. My volunteering for Compassion International has made even more of an impact on more children’s lives than I ever could have in my career. He knows the plans He has for us…Jer 29:11. Thanks Karen 🙂 A great message about the challenges of social media. I decided ages ago that I wouldn’t join Facebook etc for those reasons you mentioned AND I have little energy for it anyway. May God remind us all that “your life matters.” God bless. Thank you all for your comments, social media does have a lot of positives. It can be very encouraging too. It’s not all bad. But I totally understand those who choose not to be a part of all of it. Thank you Karen for this devotional. It sounds exactly like my life with autoimmune disease in my 30’s (now I am in my 40’s). God has replaced the lack of job fulfillment, the loss of children, etc. with other things that bring Him glory and help others. It still hurts my heart at times, but for the most part I am content. Thanks for sharing and letting us know we are not alone.